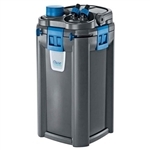 The OASE BioMaster 250 Canister Filter is perfect for marine and freshwater aquariums. 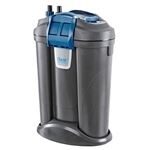 The BioMaster 250 boasts 4-stage filtration in a compact design. The biological, mechanical, chemical, and prefiltration all work together to provide your aquarium with optimal water quality and clarity. The BioMaster filters are designed with sealed filtration pathways to ensure water flow is getting the full benefits of the prefiltration filter media. The Hel-X Biomedia provides a large suspended settlement surface for beneficial bacteria growth. The EasyClean prefilter module can be removed and cleaned separately from the rest of the filter for high efficiency and to extend the life of your filter. Created for convenient placement under the aquarium. Customize your prefilter by combining coarse, fine, ultra fine, and activated carbon filter foams. Includes 4-stage filtration: biological, mechanical, chemical, and prefiltration. The Hel-X Biomedia provides a large suspended settlement surface for beneficial bacteria growth. The OASE BioMaster 350 Canister Filter is perfect for marine and freshwater aquariums. 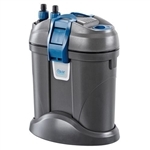 The BioMaster 350 boasts 4-stage filtration in a compact design. The biological, mechanical, chemical, and prefiltration all work together to provide your aquarium with optimal water quality and clarity. The BioMaster filters are designed with sealed filtration pathways to ensure water flow is getting the full benefits of the prefiltration filter media. The Hel-X Biomedia provides a large suspended settlement surface for beneficial bacteria growth. The EasyClean prefilter module can be removed and cleaned separately from the rest of the filter for high efficiency and to extend the life of your filter. Created for convenient placement under the aquarium. Customize your prefilter by combining coarse, fine, ultra fine, and activated carbon filter foams. 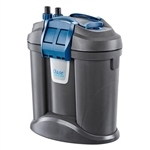 The OASE BioMaster 600 Canister Filter is perfect for marine and freshwater aquariums. 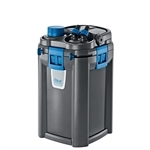 The BioMaster 600 boasts 4-stage filtration in a compact design. The biological, mechanical, chemical, and prefiltration all work together to provide your aquarium with optimal water quality and clarity. The BioMaster filters are designed with sealed filtration pathways to ensure water flow is getting the full benefits of the prefiltration filter media. The Hel-X Biomedia provides a large suspended settlement surface for beneficial bacteria growth. The EasyClean prefilter module can be removed and cleaned separately from the rest of the filter for high efficiency and to extend the life of your filter. Created for convenient placement under the aquarium. Customize your prefilter by combining coarse, fine, ultra fine, and activated carbon filter foams. OASE BioMaster Thermo 250 Canister Filter w/ Heater is perfect for marine and freshwater aquariums. This Filter is very unique as it has a Oase HeatUp 150 Watt Aquarium Heater inside! The BioMaster 250 boasts 4-stage filtration in a compact design. The biological, mechanical, chemical, and prefiltration all work together to provide your aquarium with optimal water quality and clarity. The BioMaster filters are designed with sealed filtration pathways to ensure water flow is getting the full benefits of the prefiltration filter media. The Hel-X Biomedia provides a large suspended settlement surface for beneficial bacteria growth. The EasyClean prefilter module can be removed and cleaned separately from the rest of the filter for high efficiency and to extend the life of your filter. Created for convenient placement under the aquarium. Customize your prefilter by combining coarse, fine, ultra fine, and activated carbon filter foams. Oase HeatUp 150 Watt Aquarium Heater included. It's in a slot inside the filter. The heater control pokes out the top of the filter. OASE BioMaster Thermo 350 Canister Filter w/ Heater is perfect for marine and freshwater aquariums. This Filter is very unique as it has a Oase HeatUp 200 Watt Aquarium Heater inside! 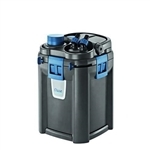 The BioMaster 350 boasts 4-stage filtration in a compact design. The biological, mechanical, chemical, and prefiltration all work together to provide your aquarium with optimal water quality and clarity. The BioMaster filters are designed with sealed filtration pathways to ensure water flow is getting the full benefits of the prefiltration filter media. The Hel-X Biomedia provides a large suspended settlement surface for beneficial bacteria growth. The EasyClean prefilter module can be removed and cleaned separately from the rest of the filter for high efficiency and to extend the life of your filter. Created for convenient placement under the aquarium. Customize your prefilter by combining coarse, fine, ultra fine, and activated carbon filter foams. Oase HeatUp 200 Watt Aquarium Heater included. It's in a slot inside the filter. The heater control pokes out the top of the filter. OASE BioMaster Thermo 600 Canister Filter w/ Heater is perfect for marine and freshwater aquariums. This Filter is very unique as it has a Oase HeatUp 300 Watt Aquarium Heater inside! 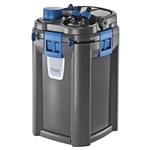 The BioMaster 600 boasts 4-stage filtration in a compact design. The biological, mechanical, chemical, and prefiltration all work together to provide your aquarium with optimal water quality and clarity. The BioMaster filters are designed with sealed filtration pathways to ensure water flow is getting the full benefits of the prefiltration filter media. The Hel-X Biomedia provides a large suspended settlement surface for beneficial bacteria growth. The EasyClean prefilter module can be removed and cleaned separately from the rest of the filter for high efficiency and to extend the life of your filter. Created for convenient placement under the aquarium. Customize your prefilter by combining coarse, fine, ultra fine, and activated carbon filter foams. Oase HeatUp 300 Watt Aquarium Heater included. It's in a slot inside the filter. The heater control pokes out the top of the filter. The OASE FiltoSmart 60 Canister Filter is perfect for small marine and freshwater aquariums. The FiltoSmart 60 has a compact design with a large filter surface. Created for convenient placement next to or behind the aquarium. Purchase with the OASE FiltoSmart 60 Canister Filter Bracket for simple attachment to the side of your aquarium. Install the included diffuser and spray bar for uniform surface movement and additional dissolved oxygen for ideal water quality. Utilizing biological and mechanical filtration, this external filter, ensures effective water filtration and optimal living conditions for aquarium inhabitants. 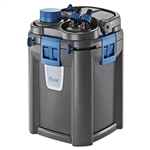 The OASE FiltoSmart 100 Canister Filter is perfect for small marine and freshwater aquariums. The FiltoSmart 100 has a compact design with a large filter surface. Created for convenient placement next to or behind the aquarium. Install the included diffuser and spray bar for uniform surface movement and additional dissolved oxygen for ideal water quality. Utilizing biological and mechanical filtration, this external filter, ensures effective water filtration and optimal living conditions for aquarium inhabitants. The OASE FiltoSmart 200 Canister Filter is perfect for small marine and freshwater aquariums. The FiltoSmart 200 has a compact design with a large filter surface. Created for convenient placement next to or behind the aquarium. Install the included diffuser and spray bar for uniform surface movement and additional dissolved oxygen for ideal water quality. Utilizing biological and mechanical filtration, this external filter, ensures effective water filtration and optimal living conditions for aquarium inhabitants. The OASE FiltoSmart 300 Canister Filter is perfect for small marine and freshwater aquariums. The FiltoSmart 300 has a compact design with a large filter surface. Created for convenient placement next to or behind the aquarium. Install the included diffuser and spray bar for uniform surface movement and additional dissolved oxygen for ideal water quality. Utilizing biological and mechanical filtration, this external filter, ensures effective water filtration and optimal living conditions for aquarium inhabitants. 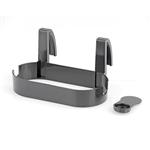 Use the OASE FiltoSmart 60 Canister Filter Bracket to easily attach the OASE FiltoSmart 60 Canister Filter to the side of your aquarium. Makes maintaining your aquarium simpler as everything is closely contained, requiring less tubing. Bracket does not interfere with opening or closing of unit, so once it is attached it does not need to be removed.